New Pet Rating System, Sortable Collections and More! 'Tis the Season for site updates and improvements! For a number of months, we've been hard at work on several upgrades to the site. So what better time than the holiday season to unveil them! Two Ratings per Pet - A pet may look awesome but have weak battle stats, or vice versa. Our old rating system didn't offer enough depth to indicate which of the top rated pets were best for combat or simply looked the coolest. You can now apply TWO ratings for every battle pet — one for Appearance and one for Battle. In addition, our Top 20 Rated Pets has been divided into tabs for Battle and Appearance. 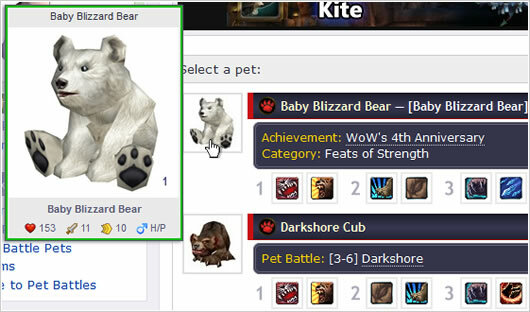 So you can easily check the highest-rated combat pets or discover which pets are considered the best looking. New Rating UI - The old rating UI was clunky. You had to open a separate pop-up to log your vote. The new UI is seamless. Click a star (or half-star) to instantly save your rating. Best of all, you can finally access your prior ratings and change them whenever you wish. Fresh Data - The new system provides a clean slate. We've wiped all pet ratings and the rating history of every user. In the days ahead, new ratings will appear and give everyone a clearer picture of the utility and likability of every pet. Whether you consider yourself an avid pet collector, an epic battler, or simply an active member of our site, start using the new rating system and make your opinion known! My Pet Ratings - We've created a page where you can easily review all your ratings, rate multiple pets, and change your ratings. 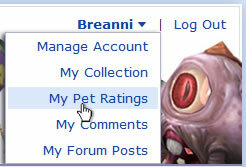 Access this page anytime by clicking "My Pet Ratings" under the user dropdown menu (pictured). To rate an individual pet, simply access the pet's profile. Log your rating in the "My Rating" section. Top Rater Achievement - Earning the Top Rater site achievement no longer requires that you rate every single pet. Once you log 250 ratings of any type (Battle or Appearance), you'll permanently earn the achievement. Legacy Top Raters - If you were one of the few users that rated every pet under our old rating system, don't worry — you've retained your Top Rater status. Better yet, now it's permanent. 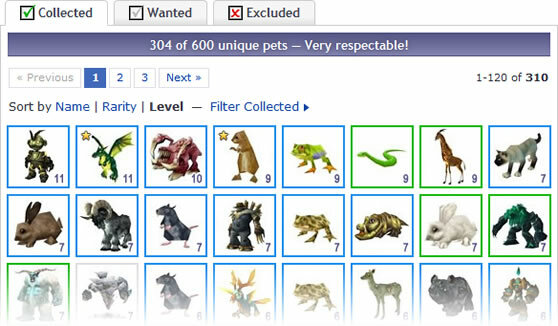 When viewing any pet collection, you'll notice new sorting options. You can sort anyone's collection by name, rarity or level. These options make it much easier to see which of your pets need an upgrade. We've been working hard on several other sought-after improvements, too! Site-wide Hovercards - Whenever you hover over any pet listed on the site, a hovercard will appear. Hovercards show the quality, level and stats of your own collected pets at a glance. Pet Stats in Pet Profiles - Pet profiles now display a list of each pet in your own collection (under "My Collection" in the General tab). You'll see the pet's custom name, quality, level and stats, plus any duplicates you've collected. Favorite Pets - Pets marked in-game as favorites in your Pet Journal are now indicated in your pet collection with a star in the upper-left corner. NOTE: Favorites won't appear in a user's collection until after a fresh Armory import is done. Breed Letter Abbreviations - Breed abbreviations, such as S/B or P/P, are now shown in addition to breed IDs in the Battle tab of pet profiles (pictured). New Bulk Exclusions - We offer two new options when customizing your collection to exclude pets in bulk: BlizzCon Exclusive pets and Collector's Edition pets. Raid Drop Filter - You'll find a new filter for Raid Drop pets so you can view a complete list of every pet that drops from a raid boss. Duplicate Realm Fix - Duplicate realms in our database have been connected. Typically, these are the same realm in multiple languages. As always, we owe a big thanks to you, the pet collecting and battling community. Updates like these wouldn't be possible without your helpful feedback and suggestions. A very special thanks goes out to our Site MVPs . Your charitable support is always welcome and most appreciated. Season's Greetings!